Libyan post-revolution government is committing in 2013 almost $5 billion (10% of its national budget) to modernizing the country’s nearly-destroyed military infrastructure, including a huge investment in air power platforms and payloads. This new report provides a focused, timely, triple-scenario analysis of possible air power evolutionary paths, by technology, operations and maintenance and unique business opportunities, including: retrofit, training, UAVs, upgrades, avionics and munitions. Post-Gaddafi Libya is once again looking to stretch its wings after several decades of trade embargoes and strategic dictatorial neglect with reported plans on a major wave of military spending. The General National Congress is understood to have approved $4.7billion in the acquisition of modern systems, equating to ten per cent of the national budget, and the developments are already underway. 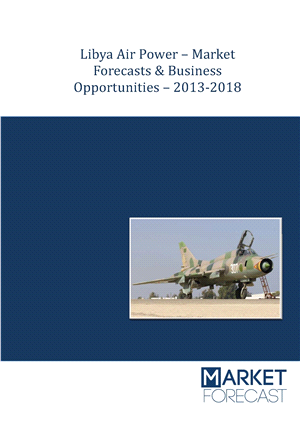 As noted in a Defence IQ report, the Air Force is seeking negotiations with schools and firms in Europe, particularly in the UK, to both refresh the capabilities of personnel and begin rebuilding the lost resources, bases and assets taken out by NATO during Operation Unified Protector.Libya is keen to demonstrate to both its own people and its neighbours that it is capable of securing its borders, particularly as instability in the region can threaten its newfound liberation.